Professor Taha is Consultant Bariatric and Metabolic Surgeon, Medical Director and Director of the Bariatric and Metabolic Surgery Center at Mediclinic Airport Road Hospital, Abu Dhabi; UAE. He is designated as Master Surgeon in Metabolic and Bariatric Surgery by the Surgical Review Corporation. He graduated in Medicine in 1983, with honors, from Basrah College of Medicine, Iraq, where he eventually became Professor of Surgery, with distinction, on 2000. He then pursued an international career and trained in laparoscopic and bariatric surgery in the USA and France. He obtained Fellowship of the Royal College of Physician and Surgeons of Glasgow, Fellowship of the American College of Surgeons, Specialization Diploma in Laparoscopic Surgery from Louis Pasteur University, Strasbourg; France and the Certificate of the Arab Board of Surgery. He was the first surgeon to win the prestigious "Fellowship Award" from the Society of the American Gastrointestinal and Endoscopic Surgeons (SAGES) consecutively on two occasions in 2006 and 2007. 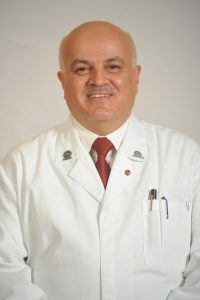 He is Founding Editor of the Basrah Journal of Surgery, Founding Dean of Thi-Qar College of Medicine in Iraq and Founding Member of the Emirates Obesity and Metabolic Surgery Interest Group (EOMSIG), now re-named the Emirates Society for Metabolic and Bariatric Surgeons (ESMBS). Professor Taha is currently Governor of the UAE Chapter of the American College of Surgeons, Member of the Board of Governors of the American College of Surgeons (Chicago), Member of the International Relations Committee of the American College of Surgeons (Chicago), Member of the International Fellowship Subcommittee of the American College of Surgeons (Chicago), Vice President of the Emirates Society for Laparo-Endoscopic Surgeons (ESLES) and Chair Elect of the Bylaws Committee of PASMBS (Pan Arab Society for Metabolic and Bariatric Surgeons). He is also member of the American Society of Metabolic and Bariatric Surgeons (ASMBS), SAGES, IFSO and the Endoscopic and Laparoscopic Surgeons of Asia (ELSA). Besides primary bariatric and metabolic surgery, Professor Taha’s special interests include surgical management of weight regain following bariatric surgery, surgical management of bariatric surgery complications, laparoscopic anti-reflux surgery and Single Incision Laparoscopic Surgery. He is an international speaker and has more than 36 published papers.